Oregon coast western snowy plover populations have increased since the early 1990s. Our Lower Bay subsystem is one of the most productive breeding habitats statewide. Marbled murrelet populations are declining across their range. The forests of Coastal Oregon may include some of the murrelets’ most critical refuges if current trends continue. Regional northern spotted owl populations have declined since the early 1990s. Locally, the rate of decline is a matter of debate and may even be negligible. Local double-crested cormorant populations have nearly recovered after declines in recent years. More information is needed to fully understand the impacts of cormorant predation on juvenile salmon populations. Because of their close ties to important economic and cultural resources in the study area (e.g., timber, salmon, dune recreation), the following birds of special concern were selected for this data summary: western snowy plover (Charadrius niosus), double-crested cormorant (Phalacrocorax auritus), marbled murrelet (Brachyramphus marmoratus), northern spotted owl (Strix occidentallis), and California condor (Gymnogyps californianus). Several of these species are rare, endangered, or threated and have been the focus of substantial public concern (see Background)(Figure 1). In 2012, Lauten et al. compiled data from nine snowy plover (SNPL) monitoring sites on the southern Oregon coast (Figure 2). 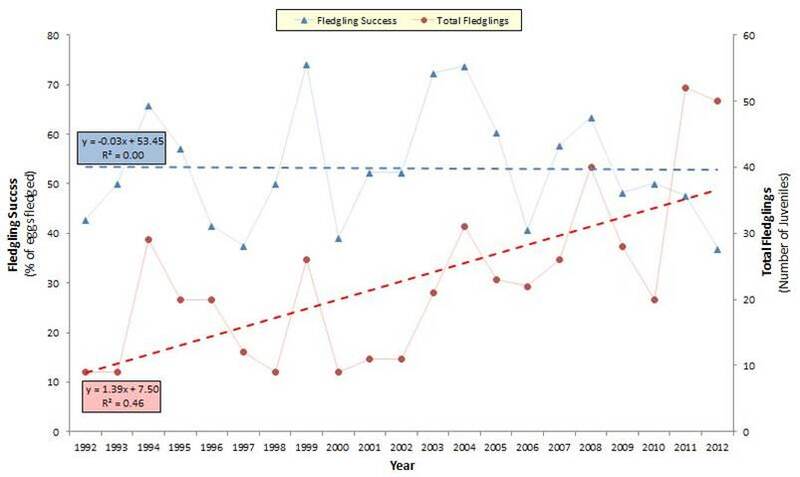 Their data indicate that, since 1990, the reproductive success of the snowy plover on the southern Oregon coast has been variable year-to-year but increasing overall (Figure 3). In addition, overwintering snowy plover survival rates on the southern Oregon coast were higher than average in 2012 (73% survival; 64% 1994-2011 mean survival)(Lauten et al. 2012). Within the study area, the Lower Bay Subsystem- the North Spit in particular- is important breeding habitat for the local snowy plover population (Lauten et al. 2012; USACE 2007; Hewitt et al. 2006). The United States Fish and Wildlife Service (USFWS 2005) designated a large part of North Spit as critical snowy plover habitat (Figure 4). Nesting occurs primarily on the southern end of this habitat designation (Hewitt et al. 2006). Like the regional data, the reproductive success of snowy plovers on the North Spit is characterized as “very high” for both nest success and in-migration of reproductive adults (Lauten et al. 2012; Hewitt et al. 2006). 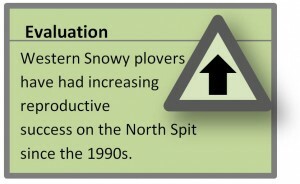 Since 1992, the reproductive effort of the North Spit adult population has been increasingly successful with 50 local snowy plover fledglings observed 2012 (an 82% increase from 1992 levels)(Lauten et al. 2012). 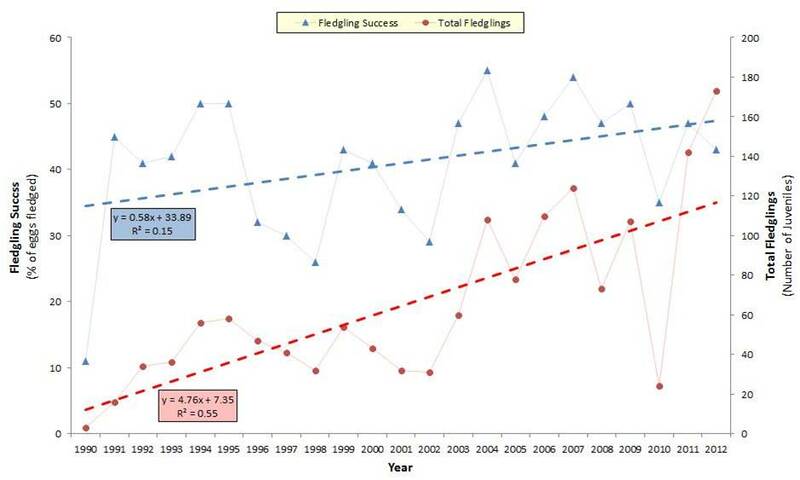 The North Spit fledgling success rate has been highly variable from year to year, and annual rates of linear change since 1992 are not statistically different from zero (p=0.94). However, researchers note that nest success on the North Spit in 2012 was “well above average” and that the hatch rate was “the highest on the coast” (Lauten et al. 2012). 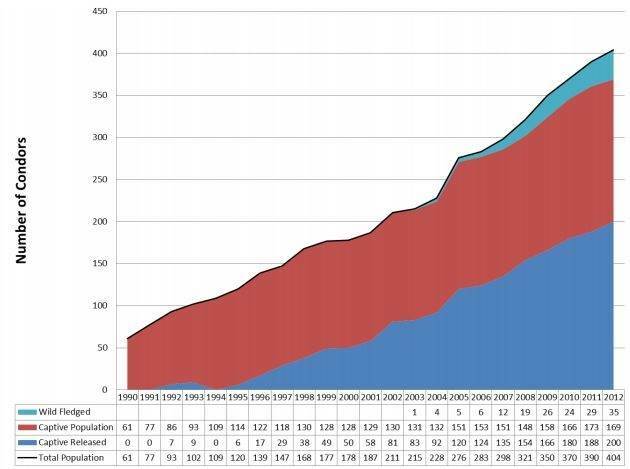 North Spit SNPL population trends are shown in Figure 5. Snowy plover populations have been federally listed as threatened since 1993 (USFWS 2014b), and listed as threatened, imperiled, or locally endangered on other registries, including the Oregon Department of Fish and Wildlife (ODFW) and global and state Natural Heritage Programs (ODFW 2012; ORBIC 2013). According to the USFWS (2014a), there were approximately 16,850 breeding double-crested cormorant (DCCO) pairs in Oregon in 2013. Most of these birds (14,900 breeding pairs) are located in the Columbia River Estuary, which supports the largest DCCO colony in western North America (USFWS 2014a; Lyons et al. 2014; Adkins and Roby 2010). Excluding Columbia River, there were 1,937 breeding DCCO pairs in coastal Oregon in 2013, a 54% increase from 2012 (1,260 breeding pairs)(USFWS 2014a; Adrean 2013). Despite recent increases, DCCO populations have decreased statewide from 2009 peak levels (2,384 breeding pairs)(Adkins and Roby 2010). There are two DCCO colonies within the study area near the McCullough Bridge. An additional three colonies are in close proximity to the study area near Gregory Point (Figure 6). 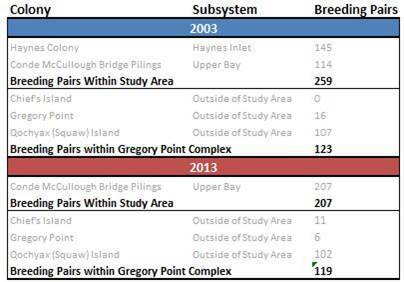 Historically, the study area DCCO colonies have been larger than the Gregory Point colonies (Table 1). 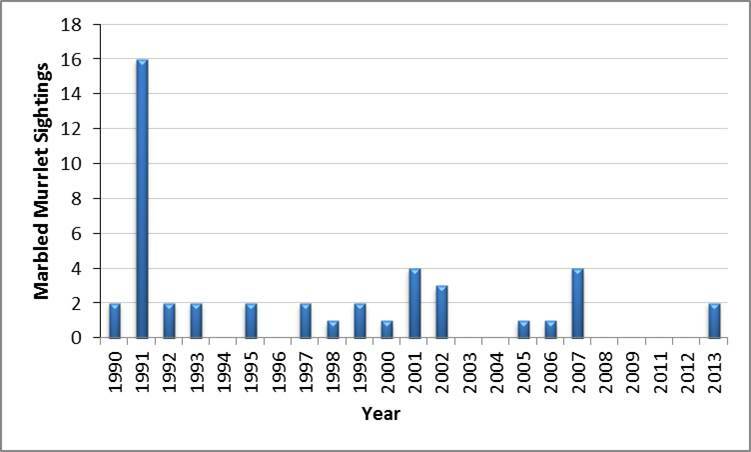 The data suggest that local DCCO breeding populations may have decreased throughout the mid-2000s, but have since recovered (USFWS 2014a)(Figure 7). 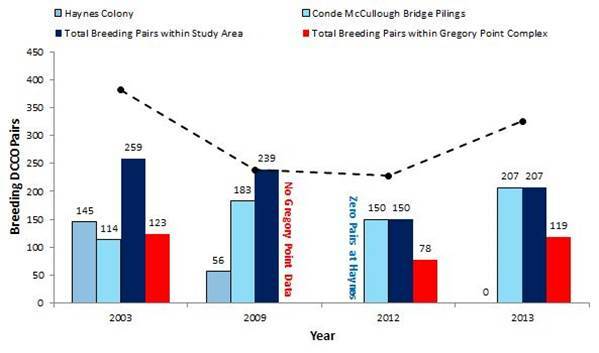 USFWS (2014a) estimates that there were 326 DCCO breeding pairs in the Coos Bay area in 2013 (down 15% from 2003)(Table 1). Public concern is often voiced about the consumption of juvenile salmonids by DCCOs, which are known to prey on more than 250 species of freshwater and marine fishes (Adkins and Roby 2010). 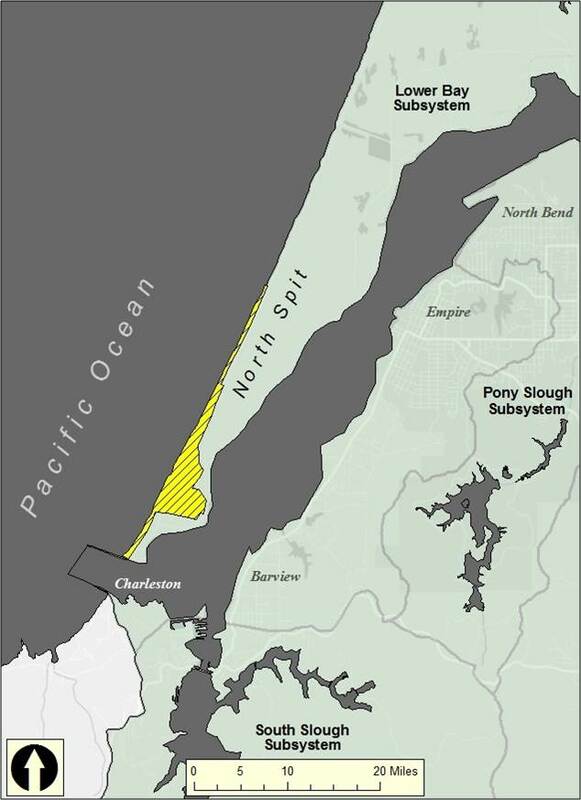 To address this concern, ODFW conducted a DCCO diet study in Tillamook Bay (Adrean 2013). 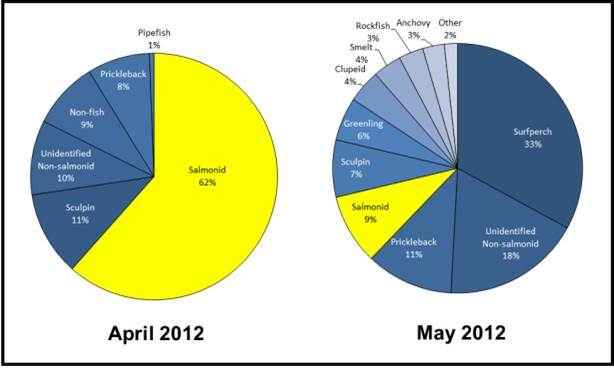 They estimated that DCCOs consumed approximately 8,000 juvenile Coho (about 4% of all outmigrating Coho smolts) over two months (Adrean 2013).Their data indicate that the salmonid component of the DCCO diet was significantly higher in April than in May (Figure 8). Steelhead (47%) and Coho (21%) comprised the largest proportion of salmonids consumed (Table 2). In 2013, ODFW expanded the DCCO predation study to include two additional estuaries. Their preliminary results indicate that salmonids comprise about 6, 11, and 7% of the DCCO diet in the Tillamook, Umpqua, and Rogue systems, respectively. 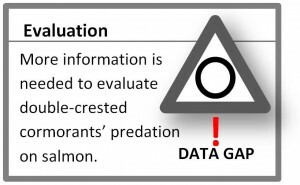 Almost all salmonids detected in the 2013 DCCO predation study were juvenile Coho salmon (J. Lawonn, pers. comm., April 21, 2014). This analysis corroborates research conducted by Oregon State University (OSU) and the United States Geological Survey (USGS) on the Columbia River (BRNW 2009) which suggests that juvenile salmonids comprise approximately 10% of the DCCO diet on average (range = 2-25%). It’s also consistent with previous studies indicating that sand lance (Ammodytes hexapterus), clupeids (herrings and sardines), cottids (sculpins), embiotocids (surf perches), engraulids (anchovies), pholids (gunnels), and stichaeids (pricklebacks) are important prey for DCCO populations in western North America (Adkins and Roby 2010). The DCCO is not listed as a threatened or endangered species (ODFW 2012; ORBIC 2013; USFWS 2014b). Marbled murrelet (MAMU) monitoring in federal forests is conducted within “conservations zones” (USFWS 1997)(see Pacific Northwest Forest Plan sidebar). The Coos estuary is near the boundaries of conservation zones 3 and 4 (Figure 9). Researchers report a decline in MAMU populations over the past decade throughout the Pacific Northwest (Raphael et al. 2011; Strong 2010; Falxa et al. 2011). The decline is thought to be substantial. 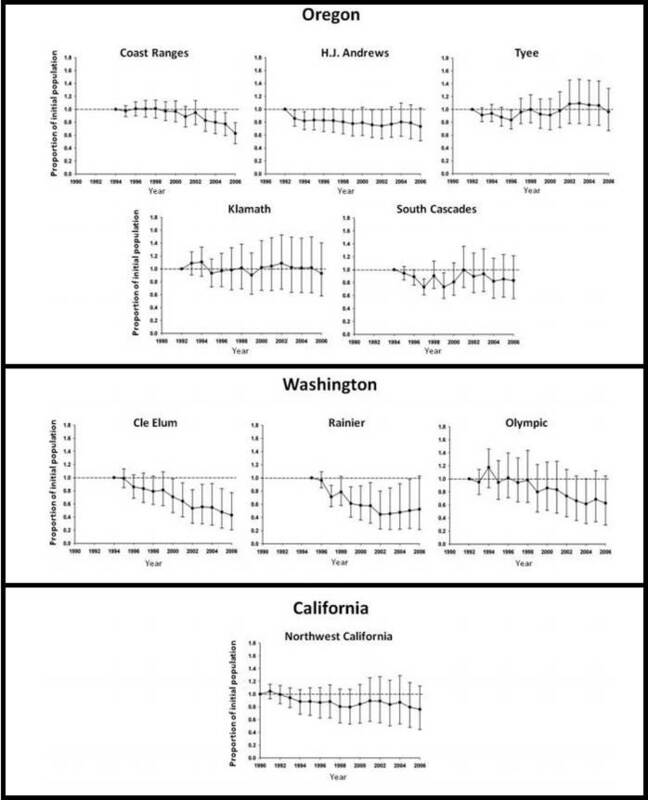 Populations in Oregon, Washington, and California have decreased about 3.7% annually (a 30% reduction in total population between 2001-2009 alone)(Raphael et al. 2011; Falxa et al. 2011). The fastest rate of MAMU population decline is occurring in northwest Washington. 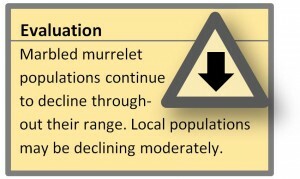 More modest population declines are occurring at the southern end of the murrelet’s range (Table 3). Survey data indicate the MAMU populations of coastal Oregon are some of the largest on the west coast. Falxa et al. (2011) estimate that the population of conservation zone 3 (Columbia River to Coos Bay) is approximately 7,200. They add that this zone alone accounts for about 43% of the entire population of Oregon, Washington, and California. 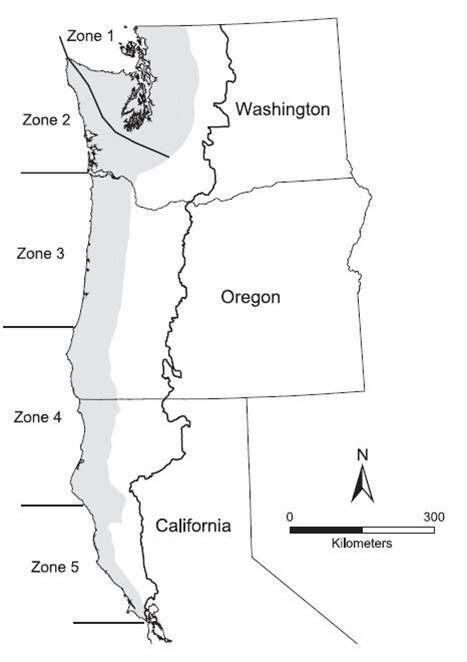 They also found that the highest at-sea density on the west coast occurred in zone 3 (4.53 birds/km2). Some suggest that the forests associated with zone 3 may play an increasingly important role if current MAMU population trends continue. In 1996, USFWS designated critical habitat for the MAMU (USFWS 1997). USFWS reserves the critical habitat designation for old-growth forests that either contain potential nesting trees or are located within 0.8 kilometers (0.5 miles) of potential nesting trees. They define potential nesting trees as “…large trees, generally more than 81 centimeters (32 inches) in diameter at breast height with the presence of potential platforms or deformities such as large or forked limbs, broken tops, dwarf mistletoe infections, witches’ brooms, or other formations providing platforms of sufficient size to support adult marbled murrelets” (USFWS 1997). Figure 11. Marbled murrelet sightings in Coos Bay from the Audubon Christmas Bird Count (1990-2013). Data: Audubon 2014, Rodenkirk 2012. Davis et al. (2011) compiled northern spotted owl demographic data from 9 study areas within 12 Pacific Northwest “physiographic provinces,” which collectively represent the extent of the northern spotted owl range (Figure 12). Their data indicate a decline in northern spotted owl populations throughout its range since the early 1990s (Figure 13). The average rate of decline was estimated at about 2.8% annually, with the greatest total loses (40-60% reduction in the adult population since 1994) occurring in Washington and northern Oregon. Spotted owl populations on the southern Oregon coast mirror regional population declines, although some debate exists. Zabel et al. (1996) estimated spotted owl population declines in the forest immediately outside the study area at a rate of 7% annually from 1990-1993. Similarly, Forsman et al. 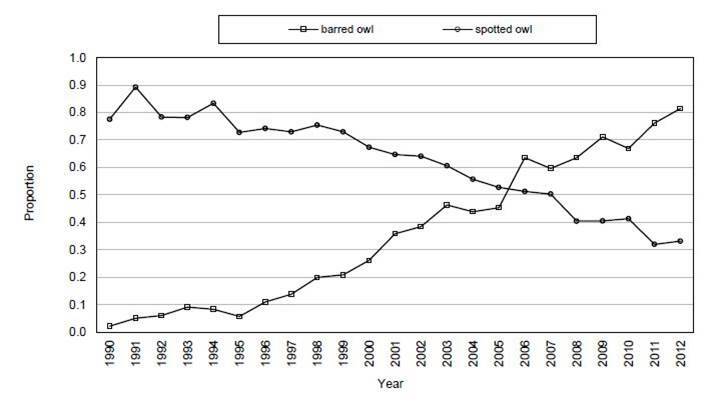 (2013) noted a steady decline in spotted owl survey detection rates on the Oregon coast from 1990-2011. 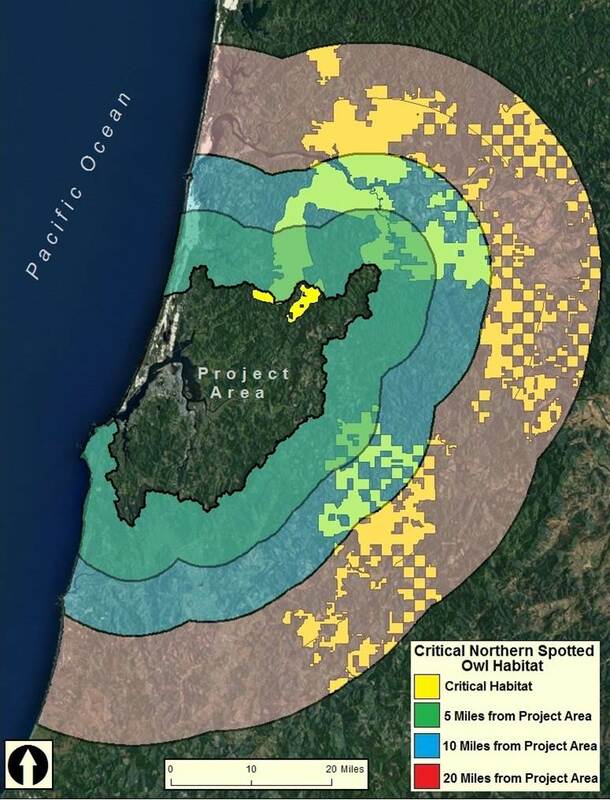 Due to the characteristics of local forests, critical MAMU habitat is relatively scarce in the study area; only one 39-acre parcel of critical murrelet habitat (in the Coos River Subsystem) is located inside the project boundary (USFWS 2011)(Figure 10). Murrelets are more likely to nest in the uplands immediately outside the project area where more mature forest stands can still be found. Hamer and Nelson (1995) estimate that Pacific Northwest MAMUs nest an average distance of 17 km (11 miles) from the coast. They report that Oregon murrelets will nest as far as 40 km (25 miles) inland. 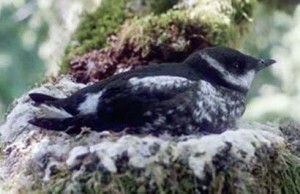 Marbled murrelets are likely to use habitat within the project area for activities other than nesting (e.g., foraging in coastal waters)(Raphael et al. 2011). The Audubon Christmas Bird Count (CBC) frequently records 1-4 MAMUs annually, with the most recent sighting (2 individuals) occurring 2013 (Figure 11). The marbled murrelet is listed as a threatened species at both a state and federal level (USFWS 2014b; ODFW 2012; ORBIC 2013). Some research suggests that the local spotted owl decline has been “moderate” (Courtney et al. 2004). High variability in the spotted owl population data (as evidenced by sizable confidence intervals) also leaves open the possibility that local spotted owl populations may declining very slowly, if at all (Davis et al. 2011; Courtney et al. 2004). The USFWS (2013b) defines critical spotted owl habitat as “…forest types of sufficient area, quality, and configuration to support the needs of territorial owl pairs throughout the year… including habitat for nesting, roosting, foraging, and dispersal.” Forest habitat matching this description is found almost entirely outside of the project area boundary, although some critical spotted owl habitat exists in the northern part of the Coos River Subsystem (Figure 14). The spotted owl is listed as a threatened species at both a state and federal level (USFWS 20104b; ODFW 2012; ORBIC 2013). California condor bones found in the archaeoligical record and historic observations suggest that condors were once a permanent resident of southwest Oregon (Miller 1942, Wilber 1973, Finley 1908, USFWS 2013c, USFWS 1996). Range contraction in the 19th century and population declines in the 20th century diminished local condor populations and distribution (Miller 1942, USFWS 1996, USFWS 2013c)(see Why is it happening?). 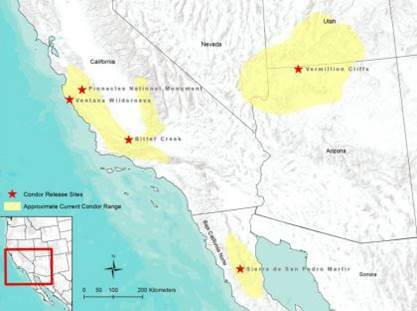 Currently, wild populations of California condors (Gymnogyps californianus) exist only in central and southern California, northern Arizona, southern Utah, and northern Baja California (Figure 15). Although the current range of the California condor does not include Oregon, many scientists and conservationists have expressed interest in restoring this extremely rare bird to its historic range in the Pacific Northwest. Currently, the Oregon Zoo (n.d.) aids USFWS condor restoration efforts by breeding condor pairs in captivity for release in California and Arizona. While restoration in other states continues, California condor re-introduction to the Pacific Northwest remains under on-going discussions. From 2012-2014, Varland et al. (2012) collected contaminates (i.e. 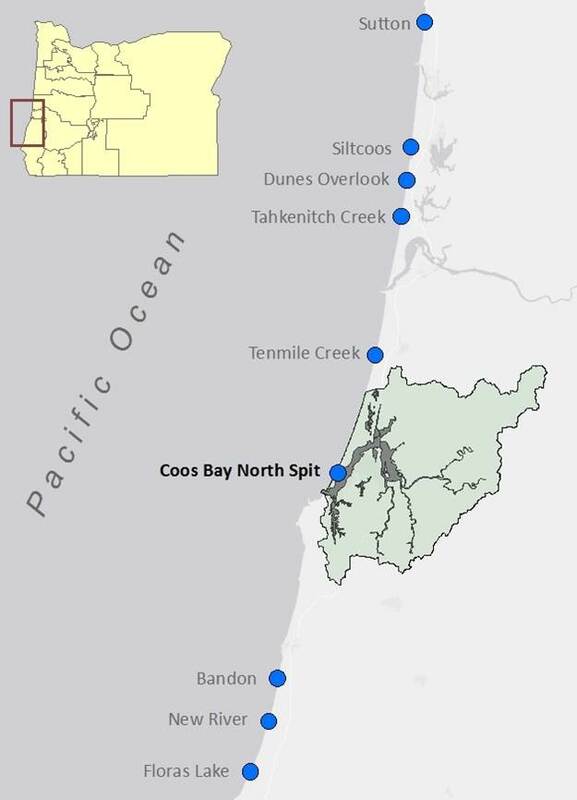 lead, organochlorines) from carrion at several locations in coastal Oregon and Washington, including specimens from the Lower Bay subsystem. Their research used other avian scavengers, such as eagles, vultures, and ravens, as surrogate species for the California condor; by determining the level of contamination in both marine mammal carcasses and in the birds that scavenge them, they could predict potential risks to re-introduced California condors. Varland et al. conclude that estimating the potential risks posed by contaminants to re-introduced condors is not yet possible because their small sample sizes limit their ability to effectively analyze the data. California condors remain federally listed as an endangered species (USFWS 2014b). Historically, snowy plovers nested in at least 29 known locations on the Oregon coast (USFWS 2013a). However, European beach grass (Ammophila arenaria), a fast-spreading, persistent invasive species, has colonized formerly open sandy dune habitats and changed dune formations (USFWS 2013a; Wiedemann 1984). Beach grass-related habitat changes are compounded by both development in beach habitats and the heavy recreational use of coastal dunes (Powell and Collier 2000). 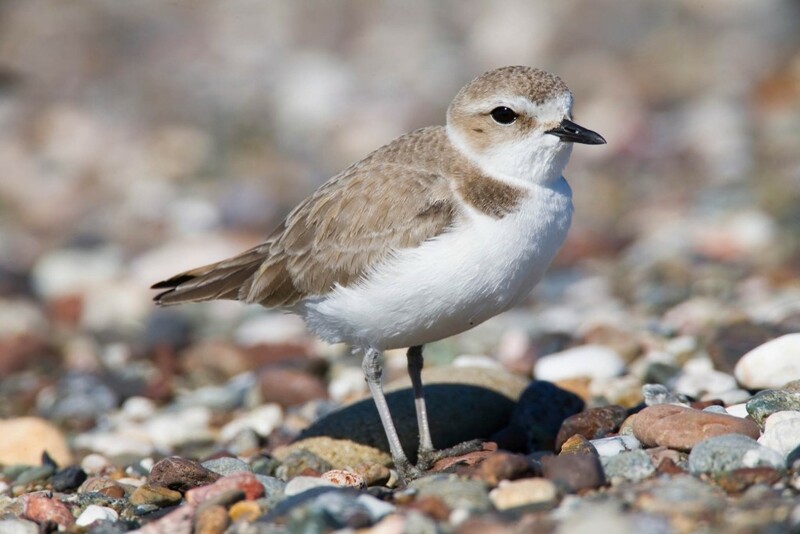 As a result, there was a substantial loss of plover breeding habitat (approximately 72% of historic habitat lost on the Oregon coast) and a subsequent decline of reproductive snowy plover adults in the early 1990s (USFWS 2013a; USACE 2007). 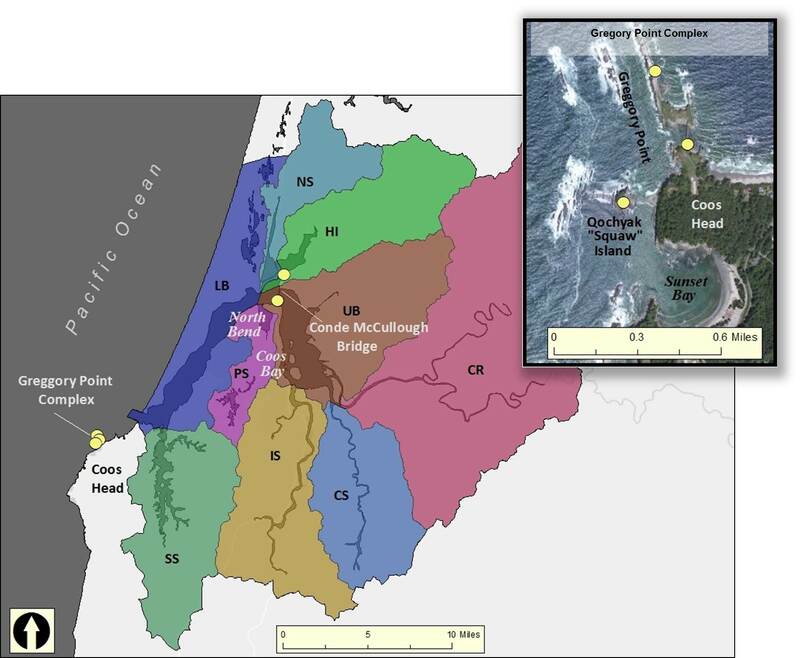 Of the remnant SNPL breeding habitats in Oregon, the Coos Bay’s North Spit remains one of the most important and productive in the state (Lauten et al. 2012; USACE 2007; Hewitt et al. 2006). Recent improvements in the reproductive success of local snowy plover populations are likely the result of a combination of the almost heroic efforts by scientists and land managers to: 1) restore plover breeding habitat; 2) reduce SNPL predator populations; and 3) monitor breeding populations (Burrell 2012 cited from Lauten et al. 2012; Lauten et al. 2012; USACE 2007). Adkins and Roby (2010) explain that double-crested cormorant populations have expanded dramatically over the past 50 years throughout western North America, with the largest increases occurring in the Columbia River Estuary. They suggest this trend is the result of various statutory and ecological factors, including the inclusion of double-crested cormorants in the Migratory Bird Treaty, the prohibition of DDT, and cormorants’ increased use of artificial breeding habitats. They also note that west coast cormorant populations are kept in check by growing bald eagle (Haliateeus leucocephalus) populations, episodic human disturbance, and the long-term effects of pollutants. As a consequence, double-crested cormorant populations remain an order of magnitude less than their counterparts in central and eastern North America. Understanding the effects of cormorant predation on local juvenile salmonids is difficult. Counts of breeding populations alone underestimate estuary use, because they do not include the (potentially substantial) population of non-breeding birds that use the estuary as a foraging ground (Adrean 2013). In addition, double-crested cormorant stomach content data vary substantially from month-to-month. One interpretation of the data is that these birds tend to be opportunistic feeders (Sullivan et al. 2006) which means that juvenile salmonids may represent a relatively large share of the local double-crested cormorant diet during smolt outmigration (i.e., when this prey species is most readily available). It’s worth noting, however, that the conclusions drawn from cormorant stomach content studies may be site-specific, because different fisheries operate under unique physical, biological, and cultural conditions (Sullivan et al. 2006). More information is needed about the dietary preferences of local cormorant populations to fully understand the effects of predation on salmonids in the Coos system. Juvenile salmonids in the Coos system are also subject to predation by other species, including seals and sea lions. For more information about salmon in the Coos estuary, see Chapter 13: Fish in the Lower Coos Watershed. Fossil records and historic observations indicate that the California condor was a permanent resident of Oregon prior to the turn of the 19th century (Miller 1942, Wilber 1973, USFWS 1996, USFWS 2013c, D’Elia and Haig 2013)(Figure 17). Range contraction and severe population decline have effectively removed this species from the Pacific Northwest (Miller 1942, USFWS 1996, USFWS 2013c). Researchers have suggested that secondary poisoning from consumption of carrion, shootings, exposure to DDT and other pesticides, reproductive problems, and collisions with man-made objects (including power lines) as reasons for condor population declines (USFWS 1996). Complex life history and low fecundity likely intensified these factors (Wilber 1973, USFWS 1996). Habitat requirements associated with the birds described in this data summary sometimes overlap with the development and natural resource uses that have fueled Pacific Northwest coastal economies for decades. These often conflicting overlaps have generated a substantial amount of public concern, followed by detailed scientific, political and economic considerations of the trade-offs associated with various human land use strategies. The continued effort to balance habitat conservation with economic progress and recreational access is a matter of on-going debate. The western snowy plover is a small shorebird weighing approximately 34-58 g (1-2 oz) and reaching only 15-17 cm (6-7 in.) in length by adulthood (USFWS n.d.). The Pacific coast population, which is listed as a threatened species at both the federal and state level, nests near tidal waters on the shore of the mainland coast, peninsulas, offshore islands, bays, and estuaries from southern Washington to Baja California, Mexico (USFWS n.d., 2014b; ODFW 2012; ORBIC 2013). Nesting occurs on flat, open areas with sandy or saline substrate, with the clutch size commonly between 1-3 eggs. Plover chicks leave the nest within hours of hatching but are unable to fly for about a month, leaving them vulnerable to predation in the early stages of their lives. Some “resident” snowy plovers remain in their breeding grounds year-round, while others migrate in the winter. Snowy plovers have “high site fidelity,” meaning they often return to the same spot year-after-year to nest. Over the past few decades, the availability of snowy plover habitat on the Pacific coast of North America has been limited by several factors, including the spread of invasive beach grass, urbanization, and heavy recreational use of coastal dunes (see Why is it happening? )(USFWS 2013a; Wiedemann 1984; Powell and Collier 2000). The subsequent plover population decline across the Pacific Northwest has sparked an on-going debate regarding the need to protect critical habitats while continuing to realize the economic benefits associated with coastal development and recreation. In the late 1980s and early 1990s, a series of lawsuits effectively halted timber harvest in the Pacific Northwest. In response to this environmental crisis, President Clinton enacted the Forest Plan for a Sustainable Economy and Sustainable Environment, which mandated that federal land managers and regulatory agencies work together to develop a plan to resolve this conflict. This legislation brought sweeping changes to the management of forest in Oregon, Washington, and California and has since become known as the “Northwest Forest Plan” (NWFP). The NWFP provides critical habitat protection for the northern spotted owl and the marbled murrelet, and now requires regional interagency monitoring of these and additional resources . The federal assessment of Pacific Northwest marbled murrelet populations is conducted within a series of “conservation zones,” developed as part of USFWS’s Recovery Plan for the marbled murrelet. Most highly suitable marbled murrelet habitat (about 89%) now occurs on federally administered land. 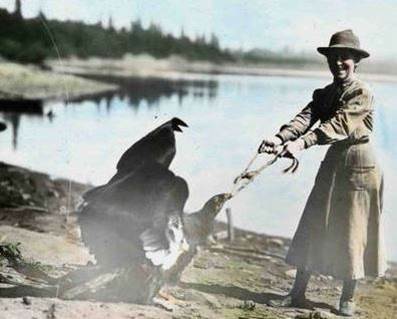 California condor conservation efforts begin as early as 1930 focused initially on habitat preservation (USFWS 2013c). Beginning in the mid-1970s, USFWS launched intensive efforts to preserve the California condor gene pool by encouraging captive breeding programs, and reintroducing condors to the wild while continuing to protect condor habitat (USFWS 1996, USFWS 2013c). Condor numbers reached a historic low in 1986, when only 9 individuals remained in the wild (USFWS 2013c). Conservation efforts have since lead to a subsequent recovery of the species (Figure 18). The California condor has not yet been re-introduced to the full extent of its historic range but populations exist in California, Utah, and Arizona (Figure 15)(USFWS 2013c). It remains listed as on the federal registry of endangered species (USFWS 2014b). Although MAMUs use the lower watershed during many life stages, they are most closely associated with their use of late-successional and old-growth coastal forests for nesting (Raphael et al. 2011). In the MAMU species recovery plan, the USFWS (1997) notes that preserving MAMU nesting habitat is critically important to the recovery of the species, because murrelet population size is “strongly and positively correlated” with habitat availability (Raphael et al. 2011; USFWS 1997). Raphael et al. (2011) estimate that over 490,000 acres of suitable murrelet nesting habitat (about 13% of the suitable habitat throughout its range) were lost between 1994 and 2007 (Table 4). They recognize fire as a major cause of habitat loss on federal land and timber harvest as the primary cause on non-federal land. These same researchers also suggest that a large majority of Oregon’s prime murrelet nesting habitat is located within the Coast Range. 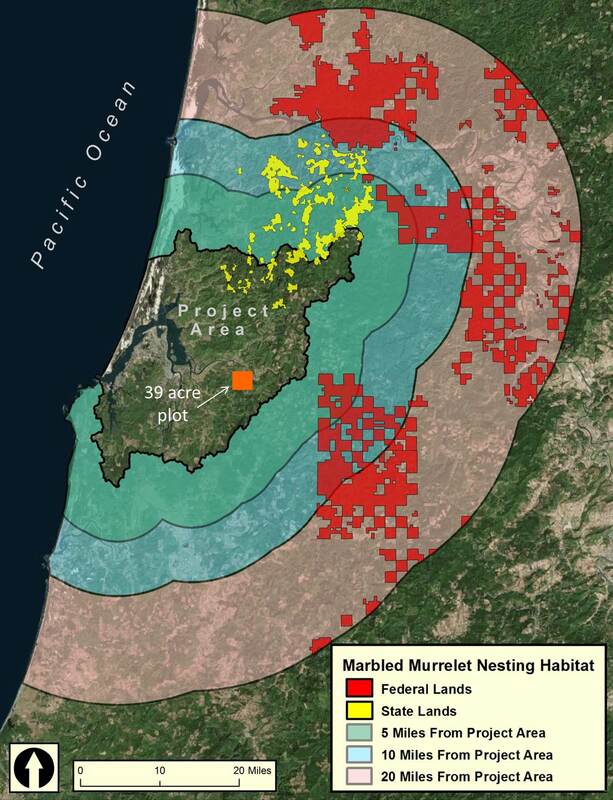 In 2007, there were approximately 936,000 acres of suitable nesting habitat in Oregon’s Coast Range alone (71% of all suitable nesting habitat statewide). The availability of this type of nesting habitat in Oregon’s Coast Range has decreased by about 32% from 1994 levels, the year in which the Northwest Forest Plan (NWFP) was first enacted. The greatest losses during this time period were on non federal lands within the Coast Range, which lost approximately 43,000 acres of prime nesting habitat primarily due to timber harvests. Research in nearby Elliot State Forest shows that local spotted owls are highly dependent on large tracts of old-growth forest, requiring an average “home range” (i.e., the area used to obtain cover, food, mates, and care for young) of about 842- 1,108 hectares (2,000-2,700 acres)(Glenn et al. 2004). Meiman et al. (2003) explains that home ranges are especially important to non-migratory species like the northern spotted owl, which depends on the resources within the home range for year-round survival. Even when other closed-canopy forests are available, spotted owls are known to travel large distances to establish a home range in the old-growth forest habitats that meet their biological requirements (Carey et al. 1990). The suitability of spotted owl habitats has been compromised because old-growth forest habitats in the Pacific Northwest have decreased dramatically from historic levels. It’s estimated that only a small percentage (5-20%) of original old growth forest in Oregon, Washington, and California remain (Raphael et al. 2011). Loses from timber harvest, disease and insects, wildfire, and other forest threats have continued across the entire northern spotted owl range in recent decades. Moeur et al. 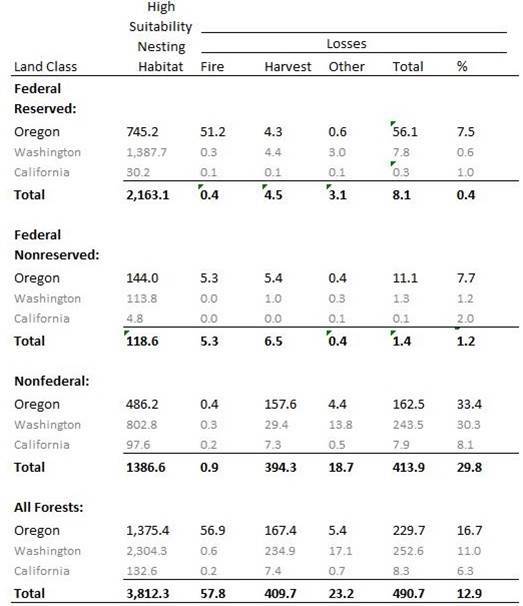 (2011) estimate that all NWFP lands (both federal and non-federal) experienced a net loss of over half a million acres from 1994-2007, with forests in Oregon’s Coastal Range alone losing approximately 141,000 acres (11% reduction) over this same time period. Alterations to spotted owl habitats (e.g., commercial thinning) are likely to result in significant habitat-use responses (Meiman et al. 2003). For example, research shows that spotted owls in Oregon’s Coast Range will traverse areas up to 85% larger to establish a home range in fragmented forests than they would in late-successional forests (Carey et al. 1992). 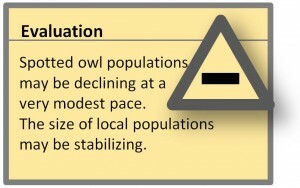 These types of behavioral responses may affect local owl populations, because any reduction in the owls’ home range habitat quality will require them to travel further to meet food requirements possibly decreasing their survival rates or reproductive fitness (Meiman et al. 2003). Population responses to habitat loss and fragmentation are likely to be compounded by other factors, such as competition for resources by the barred owl and disease. Over the past 50 years, researchers have noted that the northern barred owl (Strix varia varia) has expanded its range into southwestern Canada, the northern Rockies, and the Pacific states, where it has invaded the range of the northern spotted owl (Courtney et al. 2004). USFWS (2013b) recognizes resource competition from the barred owl as a potential threat to the spotted owl. Some surveys on the Oregon coast show that the spotted owl population decline corresponds to a concurrent increases in barred owl abundance, suggesting that this competitive threat may be substantial in the forests surrounding the study area (Figure 16). Finally, the West Nile Virus is now considered to be an emergent threat to the spotted owl (Courtney et al. 2004). Although little is known about the exact impact of this disease on owl populations, early research indicates that there is considerable concern that spotted owls may be susceptible to the disease (Rappole et al. 2000, Komar et al. 2003, Male 2003). The double-crested cormorant nests along coasts and in inlets throughout the Pacific coast of western North America (USFWS 2006). This species feeds almost exclusively on fish (Sullivan et al. 2006; USFWS 2006). Due to their dietary preferences, dramatic increases in cormorant populations in recent decades have been perceived by commercial and sport fisherman (and others) as a significant cause for concern (Adkins and Roby 2010; Sullivan et al. 2006; USFWS 2006). On the southern Oregon coast, this is particularly true in regard to the predation of salmon species, a highly valued cultural and economic resource. Sullivan et al. (2006) explain that studies designed to assess the impact of cormorant predation on fisheries are often inconclusive, because obtaining the necessary information can be complicated and expensive (particularly in large, open systems). They add that conclusions may be site-specific, because different fisheries operate under unique physical, biological, and cultural conditions. The exact impact of double-crested cormorant predation on the Coos salmon fishery is unknown and a source of continued controversy. The MAMU is a small seabird that forages in coastal waters from central California to southwest Alaska (Raphael et al. 2011). Although MAMUs spend the majority in their life in coastal waters, they nest in the uplands and sometimes travel long distances to nest in coastal forests (Hamer and Nelson 1995). MAMUs show a clear preference for nesting platforms with features characteristic of late-successional (old-growth) forests (USFWS 1997, Raphael et al. 2011). 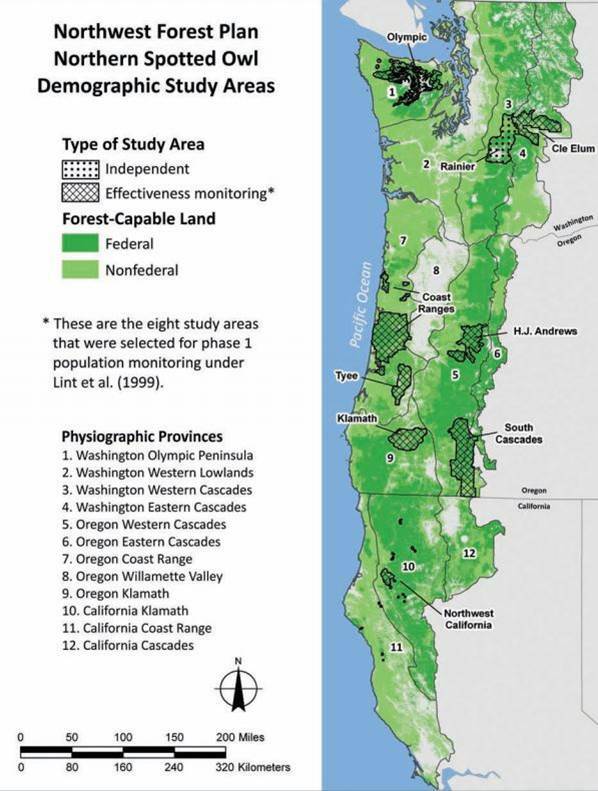 In the late-1980s and early-1990s, controversy surrounding the management of old-growth forests in the Pacific Northwest resulted in legislation that changed the way these forests are managed (see Northwest Forest Plan sidebar). The northern spotted owl’s range extends from southwestern British Columbia to central Mexico (Gutiérrez et al. 1995 cited from Courtney et al. 2004). Similar to the marbled murrelet, the northern spotted owl is closely associated with commercially valuable old-growth, coniferous forests, which it uses for foraging, nesting, and roosting (Carey 1985; Courtney et al. 2004; Meiman et al. 2003; Zabel et al. 1996). Historically, the northern spotted owl was considered a rare resident of Pacific Northwest forests (Bent 1938 cited from Courtney et al. 2004). 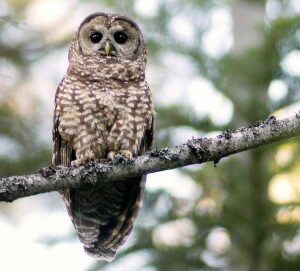 However, research in the 1970s revealed that spotted owls in the Pacific Northwest are more abundant in old-growth forests than initially thought (Forsman 1976, 1977; Gould 1977). Courtney et al. (2004) explain that this discovery, coupled with increased logging activity after World War II, created concern for the conservation status of this species. Conservation efforts became controversial when continued research concluded that spotted owls’ habitat requirements include large plots of late-successional forest with high commercial value (see Northwest Forest Plan sidebar). The debate continues today. Bent, A. C. 1938. Life Histories of North American Birds of Prey, Part 2. United States National Museum Bulletin 170: 202-213. Burrell, M. 2012. Integrated Predator Damage Management Report for the Western Snowy Plover (Charadrius alexandrinus nivosus) 2011 Breeding Season. [Unpublished report for the Oregon Department of Fish and Wildlife-Nongame Program, Portland, and the Coos Bay District Bureau of Land Management, Coos Bay, and the Dunes National Recreational Area, Reedsport]. Carey, A. B. 1985. A summary of the scientific basis for spotted owl management. In: R. J. Gutierrez and A. B. Carey (eds.). Ecology and management of the spotted owl in the Pacific Northwest. United States Forest Service General Technical Report PNW-185. : 100-114. Carey, A. B., J. A. Reid, and S. P. Horton. 1990. 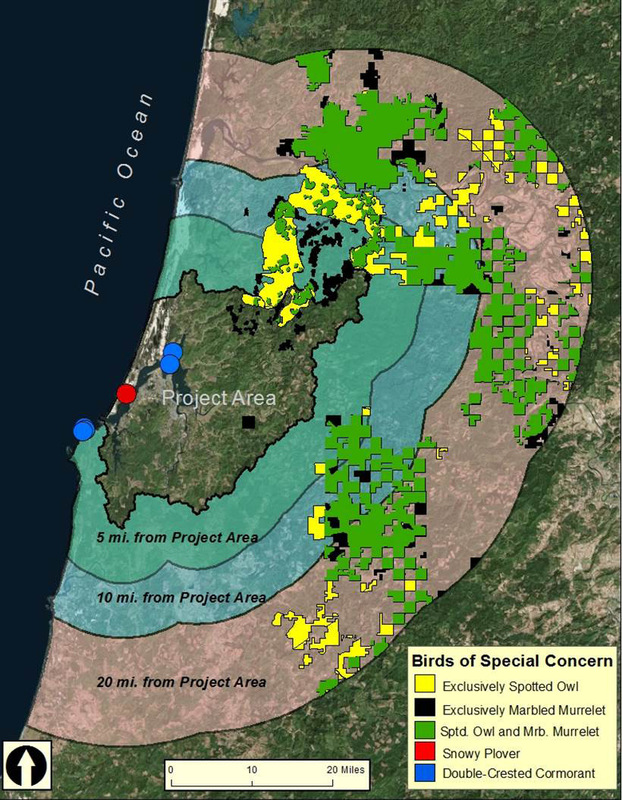 Spotted Owl Home Range and Habitat use in Southern Oregon Coast Ranges. The Journal of Wildlife Management 54(1): 11-17. Carey, A. B., S.P. Horton, and B.L. Biswell. 1992. Northern spotted owls: influence of prey base and landscape character. Ecological Monographs 62(2): 223-250. D’Elia, J. and S. Haig. 2013. California Condors in the Pacific Northwest. University of Oregon Press. Finley, W. L. 1908. Life History of the California Condor Part II: Historical Data and Range of the Condor. The Condor 10 (1): 3-10. Forsman, E. D. 1977. Spotted Owl abundance in young versus old-growth forests, Oregon. Wildlife Society Bulletin 5:43-47. Glenn, E. M., M. C. Hansen, and R. G. Anthony. 2004. Spotted Owl Home-Range and Habitat Use in the Young Forests of Western Oregon. The Journal of Wildlife Management 68(1): 33-50. Gould, G. I. Jr. 1977. Distribution of the Spotted Owl in California. Western Birds 8: 131-146. Gutiérrez, R. J., A. B. Franklin, and W. S. LaHaye. 1995. Spotted owl (Strix occidentalis).In: A. Poole and F. Gill (eds.). The birds of North America, No. 179. The Academy of Natural Sciences and The American Ornithologists’ Union. Washington, DC. Koford, C. B. 1953. The California Condor. National Audubon Society Research Report No. 4. Komar, N., S. Langevin, S. Hinten, N. Nemeth, E. Edwards, D. Hettler, B. Davis, R. Bowen, and M. Bunning. 2003. Experimental infection of North American birds with New York 1999 strain of West Nile virus. Emerging Infections Diseases 9(3): 311-322. Male, T. 2003. Potential Impacts of West Nile Virus on American Avifaunas. Conservation Biology 17(3): 928-930. Meiman, S., R. Anthony, E. Glenn, T. Bayless, A. Ellingson, M. C. Hansen, and C. Smith. 2003. Effects of Commercial Thinning on Home-Range and Habitat Use Patters of a Male Northern Spotted Owl: A Case Study. Wildlife Society Bulletin 31(4): 1254-1262. Miller, A. H. 1942. A California Condor bone from the coast of southern Oregon. Murrelet 23: 77. Moeur, M., J. L. Ohmann, R. E. Kennedy, W. B. Cohen, M. J. Gregory, Z. Yang, H. M. Roberts, T. A. Spies, and M. Fiorella. 2011. Status and Trends of Late-Successional and Old-Growth Forests. [Technical Report from the United States Department of Agriculture, United States Forest Service, and Pacific Northwest Research Station]. Oregon Biodiversity Information Center (ORBIC). 2013. Rare, Threatened and Endangered Species of Oregon. Institute for Natural Resources, Portland State University. Portland, Oregon. 111 pp. Rappole, J. H., S. R. Derrickson, and Z. Hubálek. 2000. Migratory birds and spread of West Nile virus in the western hemisphere. Emerging Infectious Diseases 6(4): 319-328. United States Fish and Wildlife Service (USFWS). 1996. California Condor Recovery Plan, Third Revision. Portland, OR. 62 pp. United States Fish and Wildlife Service (USFWS). 2014a. Catalog of Oregon Seabird Colonies. [Unpublished data]. United States Fish and Wildlife Service (USFWS). 2014c. Critical Habitat, Western Snowy Plover Shapefile. Estuarine and Coastal Sciences Laboratory of the South Slough National Estuarine Research Reserve. Accessed 06 October 2014. Varland, D. E., S. Ford, G. Johnson, and T. Hamer. 2012. Monitoring the Health of Avian Scavengers on the Pacific Coast. [Report from the Avian Health and Disease Program of the United States Fish and Wildlife Service]. Wiedemann, A. M. 1984. The ecology of Pacific Northwest Coastal Sand Dunes: A community profile. [U.S. Fish and Wildlife Service FWS/OBS-84-04]. 130 pp. Wilbur, S. R. 1973. The California Condor in the Pacific northwest. The Auk: 196-198.